Is objective psychological truth possible? For over 25 years, postmodern theorists have argued for an antiobjectivist or antirealist philosophy, which they believe enhances our human agency by freeing us to be what we interpret ourselves to be. But in the last decade, a prominent and diverse group of theorists has voiced views that are replacing those of the “conventional” postmodernists. Their dual mission is to defend the realism denied by postmodern antirealist psychologists while defending the concept of human agency that they believe modern objectivist psychologists deny. In Psychology’s Interpretive Turn, author Barbara S. Held takes the discussion to a new level. She goes beyond defending the possibility of objective psychological truth by linking that defense to the possibility of human agency or freedom. She considers the nuanced arguments of theorists who reject the possibility of objective psychological truth to advance an agentic psychology that is nonetheless alleged to be realist. She is the first to relate the common ground in these “middle ground” theorists’ attempts to reconcile, mediate, or moderate postmodern antirealist and modern objectivist approaches to psychology. She skillfully crafts the argument that any philosophy of psychology that in principle precludes the possibility of objective psychological knowledge and truth also undermines an agency founded on rational interpretive grounds. Her critique is especially timely, as concerns about psychology’s fragmentation mount and attempts at unification proliferate. 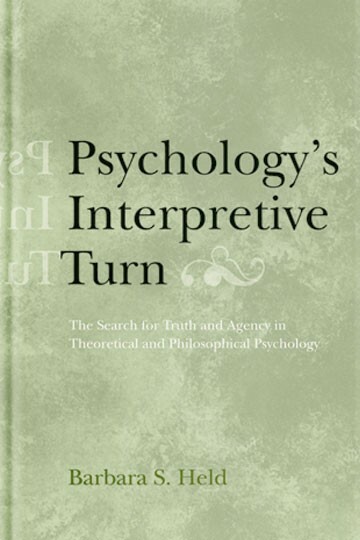 Barbara Held’s Psychology’s Interpretive Turn is a timely and welcome assessment of a recent influx of theories in psychology seeking to occupy a middle ground between what some perceive as the excesses of both postmodernism and conventional scientific methods in psychology. [Psychology’s Interpretive Turn] is surely an enlightened work, one of a depth and scale all too rarely seen in psychology…I am in awe. An incisive and original analysis of two issues—objectivity and agency—that lie at the very foundations of the study of human psychology. In Psychology’s Interpretive Turn, Barbara Held brings fresh philosophical insights to her unique defense of objective psychological knowledge against a new and growing group of theorists who reject postmodernism as much as they reject mainstream objectivist psychology. Her well-wrought arguments have far-reaching implications for how we theorize in psychology and the confidence we can have in our evidence. In reading this volume, mainstream research psychologists will discover that they have been doing philosophy all along, and that understanding philosophy is as vital to their research as their methods and results. Held explains so well the annoyance that many of us experience with postmodernism, but puts postmodernism in the context of philosophical reactions to it that bring their own set of problems. Postmodernists in psychology have embarked on a quest for a middle ground. The goal is to retain the core dogma of postmodernism (“humans just are what they interpret themselves as being”) but dodge the self-defeating implications of this dogma—to insist, for example, on a realist view of human agency and the human capacity for self-transcendence. In this book, however, Barbara Held, with heroic patience for the writings of middle-ground theorists, reveals the illusions of their Romantic quest—there is no such middle ground. Barbara Held’s forceful and well-reasoned criticism of the received wisdom in postmodern, hermeneutic, and neopragmatist psychology is timely and important. Not only does she show that these views rest on highly questionable epistemic and logical assumptions and on no small measure of implausible arguments; she also offers an important defense of the values of objectivity, rationality, and truth in theoretical psychology. The book is essential reading to anyone working at the interface of philosophy and psychology or psychotherapy. This powerful, incisive, and philosophically sophisticated critique is essential reading for anyone who cares about the future of psychological science. Barbara Held respectfully and deftly exposes the fallacies at work in the writings of the new wave of psychological antiobjectivists and the threat that they pose to a viable concept of human agency. Psychology’s Interpretive Turn is a seminal contribution to the current debate, and its influence is likely to be felt for years, if not decades, to come.